I ’m going to let you into a secret: one of my favourite gardens in the whole of the UK is right in the heart of London, and a lot of people don’t even know about it. But it’s a secret worth sharing with any garden lovers. Whenever I’m down in London for work, I like to pay a visit to a wonderful garden, right in the heart of Westminster and at the back of Westminster Abbey. The garden is known as the Abbey Gardens – there are actually three gardens in total, all hidden away and in this most amazing location right in the heart of the city. To find the gardens you need to go through the rear entrance to the Abbey and the first one you come across is the cloister garden, beautifully laid out and in perfect harmony with its surroundings. Although you can only look at this cloister garden the best is yet to come – carry on through the corridors following the signs that read “To the garden” and you come out in the enchanting space of a very old walled garden. Thought to be one of the oldest gardens in the country, these gardens date back around 900 years. I love this part of the garden; it has such a sense of history and as you look up, just over the old wall you can see the Houses of Parliament, so near they seem almost touchable. The original gardens would have been maintained by the monks who lived there, and the main area of garden which is now lawns and flower beds would have been orchards growing everything from apples and pears to medlars, nuts and figs, all for use by the monastery. Vegetable gardening would also have been important for providing fresh produce for the monastery, and we would recognise broad beans, onions and kale from the monks’ diet. The large building overlooking the lawns down the one side of this enclosed garden is Westminster School. If you have a chance to visit, go to the back borders and have a look at the fantastic fig tree that grows there, and lots of flowers spilling out onto the paths. On a summer’s day people are out sitting on the lawn and just enjoying this special space. 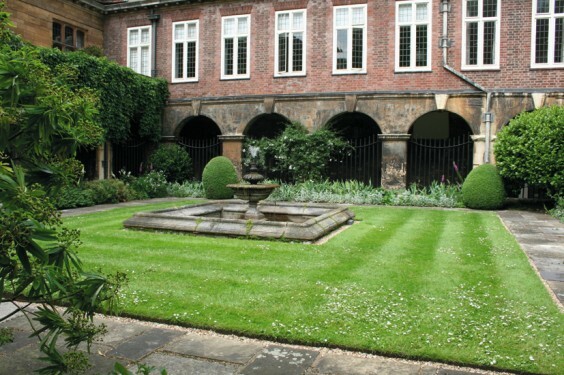 The small garden round the back of the buildings, sometimes called the College Garden, is probably the oldest of all. Part of the building in this area and some of the arches date back to the 12th century. This is also sometimes called the Infirmer’s Garden, and would have contained mostly herbs to be used for both culinary and medicinal purposes. The senior monk looking after this garden was often referred to as the Infirmer. He had the important role of administering herbs to treat any illnesses or infirmities in the monks who lived there, and at a time before doctors would have been available for the common people, the Infirmer would have offered his herbal remedies to people on the street. The herbs are recognisable to us today, as are some of their ancient uses: rosemary, which still grows in this garden, would have been used as a stimulant for loss of sight or memory; fennel would have been administered for dietary problems and colic, and hyssop for bronchial complaints. The garden is now run by Jan Pancheri, whom I have come to know well since my visits. She has a great knowledge and passion for this lovely garden, and is slowly replacing any modern planting with varieties and plants that would have been around when the garden was founded. Jan grows many of the plants from seed and cuttings so the greenhouse and cold frames are always full. I’ve had the privilege of planting up some of the borders when I’ve been down on a visit. Jan developed such an interest in the stories of the original monks who would have gardened there that she has now written a book about one monk called Brother William – it records a year in the garden in the form of a diary. The garden is only open from Tuesdays to Thursdays between 10am and 6pm and although it costs nothing to go in, they do ask for a donation towards the upkeep costs. So if you do find you have some time in the capital and you need to get away from the frantic hustle and bustle, remember this little gem and spend some time enjoying a really beautiful old garden.